Before we look at normal balances, let's refresh our memory on what we've got so far. Earlier, we looked at how to write a business transaction in the form of a journal (double) entry. We also saw how these entries go into accounts, either on the debit (left) side, or the credit (right) side. To refresh your memory on the Double Entry system, see here. Remember the accounting equation and the rules pertaining to debit/credit? Any increase to the left side of the equation will be a debit. Any increase to the right side of the equation will be a credit. Therefore, increase in assets will be debits. Increase in liabilities will be credits. Increase in owner’s equity will be credits. You can see that there is a tendency for assets to be a debit balance. Liabilities will tend towards a credit balance, and owner’ equity accounts will lean towards the credit side as well. Therefore, we say that the normal balance of an asset-type account is a debit. The normal balance of a liability-type account is a credit. And the owner’s equity-type account shows a normal credit balance. However, in the case of an asset-type account, there is an exception. Assets usually experience depreciation, which reduces the value of the assets to reflect normal wear and tear. For instance, a piece of machinery will need to be depreciated because continual use will eventually degrade its performance. This depreciation charge will be entered into a separate account, termed Accumulated Depreciation. Each depreciable asset will usually have its own Accumulated Depreciation account. Since it reduces the value of the asset, the normal balance of the Accumulated Depreciation account is a credit. Some owner’s equity-type accounts are different too. Within this category, we have the Drawings account, which refers to funds/stock taken by the owner out of the business for his own use. 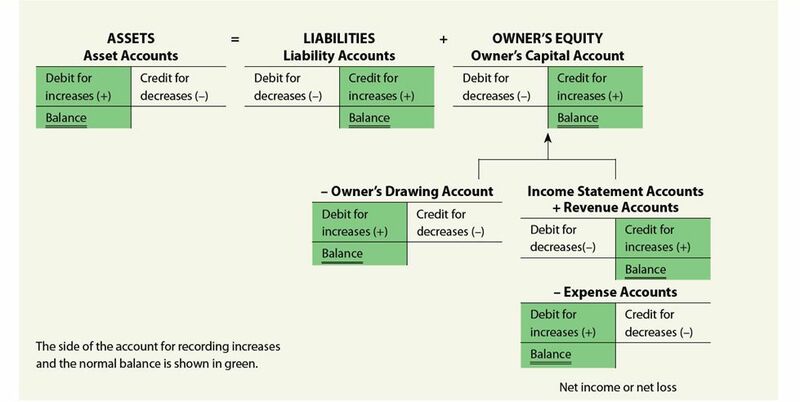 As this effectively reduces owner’s equity overall, the Drawings account will exhibit a normal debit balance (opposite to the default credit balance of owner’s equity as a whole). Owner’s equity also includes Revenue and Expenses – because profits generated (revenue minus expenses) will ultimately increase owner’s equity. (Conversely, losses made will reduce owner’s equity.) Therefore, the Revenue account will have a normal credit balance. Expenses will have normal debit balances because they decrease overall owner’s equity.